A record-breaking hoard of Iron Age coins has been found in Jersey, archaeologists have announced. Estimated to contain between 30,000 and 60,000 coins, if the upper estimate is correct the find could push the Frome Hoard of 52,000 Roman coins into second place as the biggest coin hoard ever discovered. Weighing ¾ of a tonne, the cache is the largest collection of Celtic coins found in Jersey, an island known for its Iron Age coin hoards. SociÃ©tÃ© Jersiaise archaeologist Robert Waterhouse told CA how this latest discovery was made. With the permission of the landowner, two metal detectorists had been combing the field where the hoard was found for several years, convinced that the occasional coins they found at surface were coming from a hoard being scattered by the plough. When they found a possible hoard, very properly they then called in Olga Finch, Curator of Archaeology at Jersey Heritage – the organisation who look after the island’s museums and archaeological collections. Concerned that if the news leaked out, the hoard would be under threat from illegal detectorists, known as ‘night hawkers’, the decision was taken to excavate and retrieve it for safety and a scratch team was put together, comprising Dr Philip de Jersey (an expert in Celtic coinage); Robert Waterhouse FSA (Archaeologist for the SociÃ©tÃ© Jersiaise); Neil Mahrer (Conservator to Jersey Heritage) and Olga Finch. Both the hoard’s finders were on hand to use their expertise and equipment to ensure no coins were lost in the spoil, while volunteers from the finders’ and landowner’s families, and the SociÃ©tÃ© Jersiaise Archaeology Section, came along to assist with spoil removal and sieving. 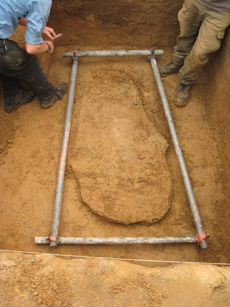 Careful excavation and recording by Robert Waterhouse and Philip de Jersey showed that the coins had been deposited at the bottom of a roughly dug pit, a metre below current ground surface (though the Iron Age ground surface has been lost to ploughing). The hoard formed a tear-drop shaped solid mass, measuring 143cm x 80cm x 20cm, and the coins which have been identified to date are all of Armorican origin (modern day Brittany and Normandy) from a tribe called the Coriosolitae, who were based around the Rance valley in the area of modern-day St Malo and Dinan. They appear to be of ‘billon’ – an alloy of copper and silver. A number of late Iron Age coin hoards are already known from Jersey, which has produced more coins of this period than any of the other Channel Islands. Most of these hoards are thought to date from the period c.55 BC to c.30 BC (Late Iron Age), at a time when the Roman armies of Julius Caesar were advancing north-westwards through France, driving the tribal communities towards the coast. It is thought that some of them may have crossed the sea to Jersey, finding a safe place of refuge away from Caesar’s campaigns. The only safe way to store or hide their wealth was perhaps to bury it in a secret place, such as in or near a hut. This could be significant, as in addition to the pit containing the hoard, the excavation produced extensive evidence for timber buildings, in the form of possible post holes or storage pits, containing large quantities of burnt daub, late Iron Age and early Roman pottery. Slag and furnace linings were also present, in conjunction with 1st century BC Roman bronze and silver coins, some of them broken or cut in half. This raises the intriguing possibility that Roman coins were being melted down for some reason. Have we found the site of a mint? Certainly, some of the burnt daub and ashes found their way into the backfilling of the hoard pit nearby, suggesting that the two were linked. This is an extremely important archaeological find of international significance. The fact that it has been excavated archaeologically is also rare and will greatly enhance the level of information we can learn about the people who buried it. It is very rare that coin hoards like this are excavated archaeologically, so we are indebted to the finders for leaving their discovery in situ and reporting it straight away. With this kind of cooperation, we have been able to gain so much more information about the find and the site by studying the context in which the hoard was found. Neil Mahrer, the Conservator for Jersey Heritage, made the decision to lift the hoard in a block of soil, wrapped in foam sheets and polythene strip, sandwiched between two boards. 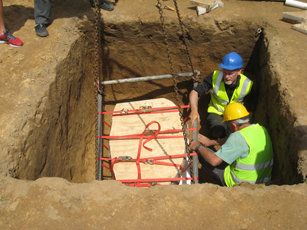 t was slung from a scaffold-pole frame and hoisted out on the hydraulic arm of a flatbed truck, which transported it safely to Jersey Archive, where a vast amount of work will now commence to conserve and identify the coins. The finders and the landowner have said that they want the hoard to be put on display for the people of Jersey to enjoy. As the find contains objects of precious metal, it has been reported to HM Receiver General who will liaise closely with the finders and other interested parties to determine the status of the hoard. The site is currently protected as an Area of Archaeological Potential. The urgent work undertaken to archaeologically record and then remove the coin hoard was agreed by the Planning Minister of the States of Jersey, to ensure that it was removed in a controlled and appropriate manner. In due course, the level of protection on the site will be increased. This is amazing and fabulous; on the security side, can we stop giving illegal detectorists a romantic-sounding name? Call them artefact thieves or something (like the cable thieves that are publicly hated)? This is a fantastic find, professionally and responsibly handled. As for calling the illegal detectorists ‘nighthawks’? Why make them sound like superheroes – they’re scum. Amazing ! congraulations to all concerned. This ‘find’ appears to have been handled in a very professional manner.